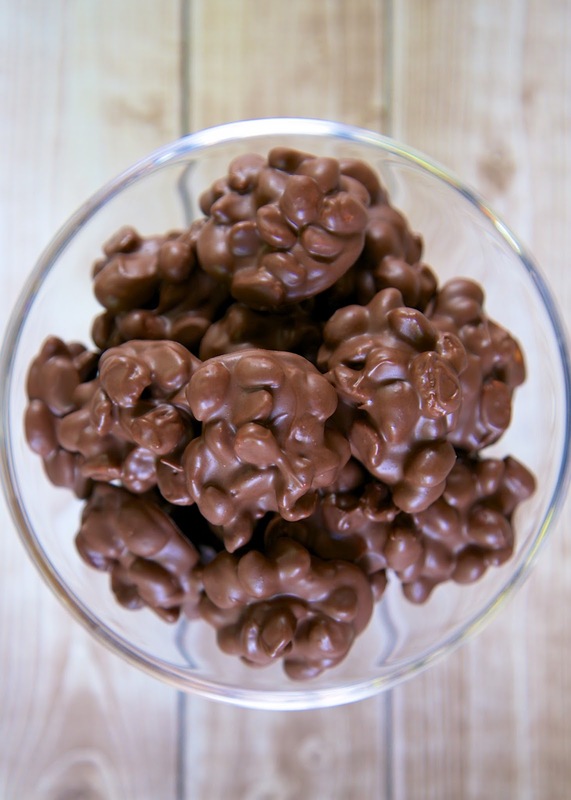 Honey Roasted Chocolate Peanuts - sweet & salty in every bite! Only 2 ingredients!! Last year I made some easy Mr. Goodbar Bites. They are so good and only have two ingredients! Someone recently left a comment on that post that they used Honey Roasted Peanuts instead of regular Dry Roasted Peanuts. Genius! Sweet and salty all in one bite! I had to give it a try! 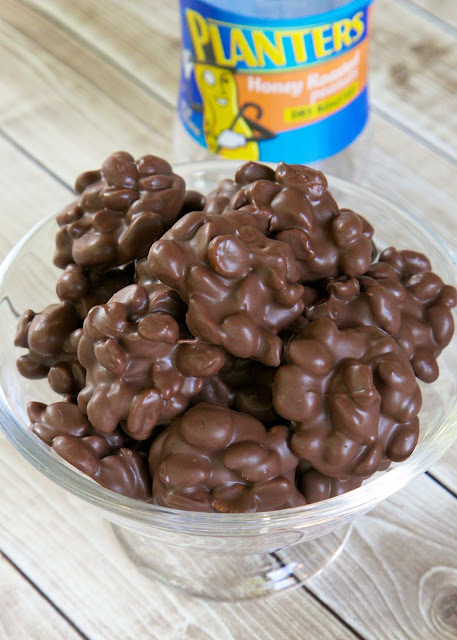 They are so easy to make, and like the Mr. Goodbar Bites, they only have two ingredients. I used the Plymouth Pantry brand of chocolate almond bark from Wal-Mart. It is inexpensive and works great. These peanuts are great by themselves and even better chopped up on ice cream! Melt almond bark according to package directions. Stir in peanuts. Drop rounded tablespoons on wax paper. Allow to set up. I was lucky enough to try these and oh my are they fantastic. The chocolate is as good as any store bought candy bar and the peanuts are the perfect amount of crunch and salt!! These are addictive!!! Oh wow this is genius! Love those comments for new inspiration! These sound GREAT!! I make something similar and they need to be kept in the fridge. Do yours do well in a tightly closed container on the counter or shelf or do they need refrigeration so the chocolate doesn't get soft and mushy? We just keep them in a ziplock bag and they are fine. Great! Thank you for the nice response. I'm making yours this weekend!! War Eagle!! Sound amazing! Must make soon. How many patties does this recipe make ?? If you can't get the Plymouth Almond Bark is there another type of bark or method that you can use? These are great & so easy. I use Chocolate Chips. They are to die for make with dark chocolate.